I’m in a deep dynasty league (40 player rosters X 12 teams) and have the opportunity to pick up some of the leftovers from the waiver wire. Our wire currently includes guys like Juwan Thompson, Jeff Janis, Damien Williams (the RB, not the WR), Kevin Ogletree and a handful of other really deep sleeper types. If you had to pick two from the list above, who would it be? And would you recommend any other super deep guys? With rosters that big, you have to go dumpster diving. However, occasionally you’ll find some gold down there. From the group you mentioned above, I’d go Juwan Thompson and Jeff Janis. My favorite of the group would be Janis. He’s 6′ 3″ (yes, size matters as explained by this very good article about receivers and height), on a very good, pass-happy offense that has stability, and is a rookie. I’d keep Janis with an eye on 2015. Juwan Thompson is part of the merry-go-round known as the Broncos running back corps. There never seems to be certainty in Denver which means anyone could be called on at anytime including Thompson. Ronnie Hillman and C.J. Anderson are JAG’s. Thompson can already pass protect and play special teams, where he’ll probably spend most of his time. Another sleeper I’d consider is Brandon Williams, tight end from Carolina. He’s 6′ 3″ with a 4.5 40-time and earned high marks in the run game this pre-season. As Greg Olsen can attest, Carolina uses their tight ends more than most and Williams has only Ed Dickson ahead of him on the depth chart. 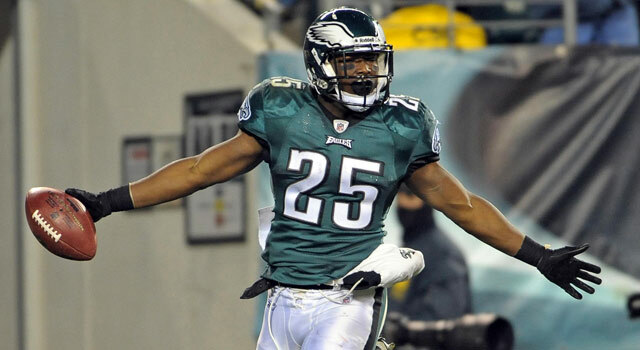 Be sure to get your questions in to dynastyfantasyfootballcentral(at)gmail(dot)com. I am in a keeper “by round drafted” league and need to keep 2 of the guys listed. I think I have some great options. I’ve got it listed in order of how I am leaning now, but I could justify picking several of these guys. Help! That’s quite the roster you accumulated and hope you went far last year! As for this year, you have to look at the value you’re getting. 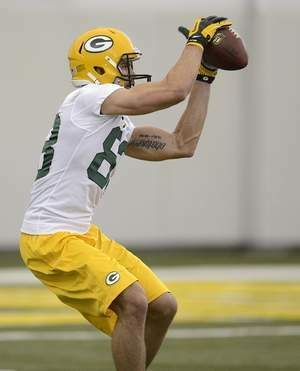 First, I would keep Jimmy Graham if it means giving up ‘only’ a third rounder. If you check out his average ADP, Graham is going in the first round in most drafts. Only giving up a third is a value and gives you an elite option at tight end. The second option is a little trickier. For me, it’s between Alshon Jeffery and a 10th and Keenan Allen, who was undrafted. His 89/1,421/7 line was incredible and should continue in the same offense as last year. Allen had a very good season with 71/1,046/8 but is not in the same offense as Jeffery. Both provide good value with later picks but I give the edge to Jeffery. Remember to email your dynasty questions to dynastyfantasyfootballcentral(at)gmail(dot)com. As always, email your dynasty questions to dynastyfantasyfootballcentral(at)gmail(dot)com. On to the questions! I have Vernon Davis, DeSean Jackson, Vincent Jackson, Matt Prater, Josh Gordon, Colin Kaepernick, and Jay Cutler and need to keep two. Who should they be? First order of business is to cross Matt Prater off the list. Sorry, Matt. Quarterback – Jay Cutler, Colin Kaepernick – I think quarterback is a premium position and if you can get a good, young one you have to do it and Kaepernick fits the bill. At 26, he has a long shelf-life while the coaches should be taking the training wheels off this year. Reports have already hinted that Kaepernick will pass more thanks to the trade for Stevie Johnson and a healthy Michael Crabtree. He was already a top-1o fantasy quarterback last year and there’s no reason for him to regress. Meanwhile, Cutler is already 31 and while he might have the better fantasy offense, hasn’t played a full 16 games in five years. The choice is easy for me. Tight End – Vernon Davis. If you check out our dynasty wide receiver rankings, Davis is firmly entrenched as the 7th best tight end, higher than either Jackson and even Josh Gordon now while his offense, as noted above, is expected to pass more. Among the players available, Davis is the only one that could be considered elite and give you an advantage over most teams in your league. 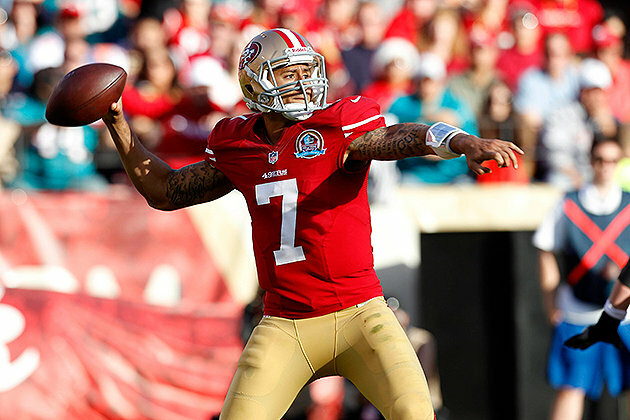 So there you have it – we go all 49ers with Colin Kaepernick and Vernon Davis. I think you can get a quality receiver in your rookie draft to make up for the lack of a keeper but Kap and VD should keep you competitive for years to come. Remember to get your dynasty questions in to dynastyfantasyfootballcentral(at)gmail(dot)com. Questions about a trade or draft picks or an aging veteran, send them our way! Remember to check out previous questions here. We start QB, RB, WR, 3-Flex, Def & K., 0.5 PPR, bonus for 40+ yd catch/runs. No starting TE but we can flex one if we choose. Must start one RB and one WR and we can start RB/WR/TE as any of the 3 other Flex positions. Should I accept the 3rd overall pick plus Steven Jackson for my 2nd overall pick? Quarterback – With Tom Brady at the helm, a quarterback isn’t necessary at 2, 3 or even 7. That will allow you to use both first round picks on a running back or receiver. Running Back – You have your starter in Montee Ball but nothing else as far as a flex position. Both Browns and Randle are nothing more than backups. The question whether Steven Jackson will add some punch. Last year was a nightmare for Jackson as he was injured most of the year and averaged only 3.5 YPC. Now, he played behind a horrible line which is now vastly improved but he’s also 30 years old. 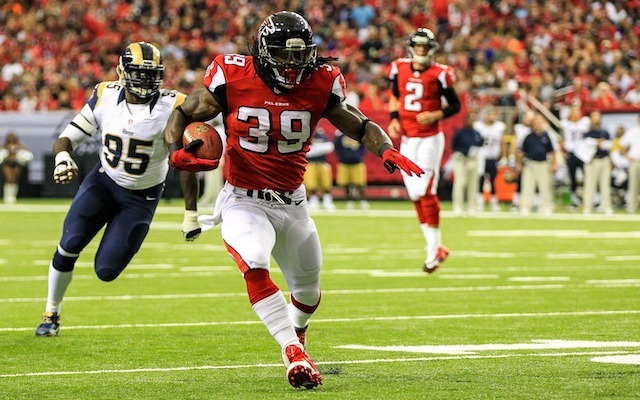 Running back is definitely a need for you but, personally, I don’t think Steven Jackson is going to do it. For your draft, if you consider our first rookie mock draft, you’ll have your pick of running backs at seven. You could go with an instant starter like Bishop Sankey or even Jackson’s backup Devonta Freeman who is impressing in minicamp. 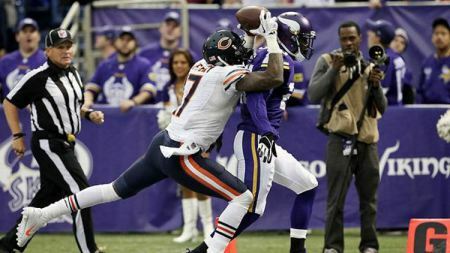 Wide Receiver – You have a stud in Jeffery so there’s your starter. Emmanuel Sanders will be a great flex play now that he’s in Denver. You have a couple of guys that could fill in for one of the flex positions including Reggie Wayne or even Kenny Stills. That leaves you with one of the top receivers in this years rookie class, whoever is left of Mike Evans and Sammy Watkins. Both are elite prospects who should produce right away for you. In conclusion, I don’t think the gap between a Watkins or Evans is that great over other receiver prospects like Odell Beckham or Brandin Cooks. But I have my doubts that Steven Jackson still has any gas left in the tank. I think you’d do well to get a Watkins/Evans plus a potential running back in your fist round.